Max. 1440 dpi. 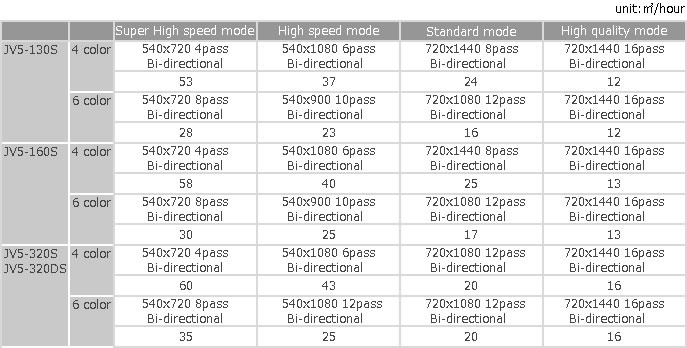 Variable dot sizes are adopted. 1head consist of 8 lines of 180 nozzles. 4 times as nlany as the conventional head. Totaling 1,440 nozzles. Output capacity - in the case of using a practical image quality for short distance signboard (540 x 1,080 dpi). Cutting edge function for high speed continuous printing. JV5 can utilize four cartridges per color in 4-color mode. 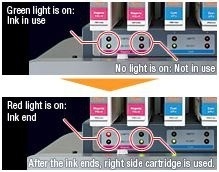 When the ink cartridge runs out, another cartridge begins supplying ink and helps prevent running out of ink. A maximum of 1,760cc ink per color can be loaded at one time. An aggressive solvent ink which meets the needs for high scratch resistance and high-speed high density printing. This ink provides the ability of printing on various types of media with high scratch resistance. Compared to HS ink, SS21 ink would be inferior to fast drying. Virtually odorless and user-friendly ink which does not require any special ventilation. Ink which has high light fastness and can reproduce vivid and delicate color tones. Fast drying and high density ink for sublimation transfer to polyester substrates. The media is transported evenly without being affected by the varying weight of the roll media. This eliminates any banding caused by irregular feeding of the media so maintaining the highest. Monitoring ink-discharging state from the printing head and ink clogging is quickly detected and cleaned, saving the waste of media and ink. In addition, equipped with exhaust fan and exhaust duct to quickly evacuate ink odors. Control the odor of ink generated during printing. 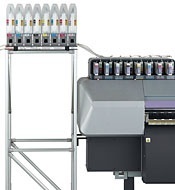 Special equipments support heavyweight roll media printing of JV5-320S. Secure operation with wider media. Feeding device and take-up device for heavy media. Feeding device and take-up device can securely feed even heavy media with the width of 3,250mm (128"). Heavy media weighing over 100kg (220lbs.) can be fed with constant tension by means of tension bar and winding device. Direct sublimation printing and sublimation transfer printing are able to reproduce vibrant color on polyester fabric while retaining fabric texture. Take advantage of rub and water fastness, these printing methods are used for fabric signage, T-shirts and uniforms. Direct printing on pretreated polyester fabric without using transfer paper. After direct printing, the polyester is heated for color production and fixation. Direct sublimation printing is transfer paperless environmentally friendly method, and provide high level print results with sharper image than transfer printing.